What Bugs Come Inside in the Cold? As temperatures drop, some bugs head to warmer climes. However, not all bugs travel, and those who stay to overwinter locally are likely to view your nice, warm house as a place where they can stay toasty during the cold. In nature they find crevices and trees outdoors, but since man began building shelters, bugs have taken up residence as uninvited guests. Most bugs are more of an annoyance rather than an actual pest. One way bugs arrive in the house is on firewood. Bringing firewood in and storing it by the fire, instead of in an outdoor shed, can produce an beetle invasion. Various beetle species may lay eggs in cut wood when it's outside. The larvae turn into pupae at the end of summer, and wait for warm spring weather to emerge. Bringing the wood into the warmth creates spring-like temperatures, which triggers the emergence of an adult. The nautical borer commonly arrives in homes via firewood. He's black, about an inch long and scurries about the floor like a spider. He's harmless, and the best way of dealing with him is vacuuming him up, according to BugInfo. Flies can feel like a pest, even if they're harmless. You might find cluster flies, face flies and blow flies indoors during winter. Cluster flies are a bit larger than the common house fly. It gets its name from settling in groups on a surface. It lays its eggs on the earth in your yard. The young emerge as maggots and feed on earthworms. They take parasitic residence in the worms for a fortnight before emerging as adults. The adults make their way into the house through any available opening and you might find them congregating on curtains and walls. The face flies and blow flies feed on garbage, so keeping that to a minimum outside the house helps control them. The box elder bug is well-known around the United States. He measures about a half-inch in length and has gray wings and a distinctive red body. He's a clumsy flier and likely to bump into you. Like the stinkbug -- another unwanted winter guest -- he makes a nasty smell when you crush him. These bugs gather on the outside walls of your home as temperatures drop and scuttle inside as winter approaches. According to BugInfo, these bugs colonize box elder and maple trees. The website advises home owners with these trees to check them for bugs during summer and deal with them then. Other bugs in this class are the assassin bug, the leaf-footed bug and the grass bug. The assassin bug is the one that cases most problems because he bites. Apart from the ladybug, most beetles arrive in your home on foot. Generally, they live around wood in your yard in warmer weather, so checking stored lumber and trees could prevent an invasion. These beetles are generally classified as ground beetles and there are thousands of species. Like some of the bugs, many emit a bad smell to protect them from predators. 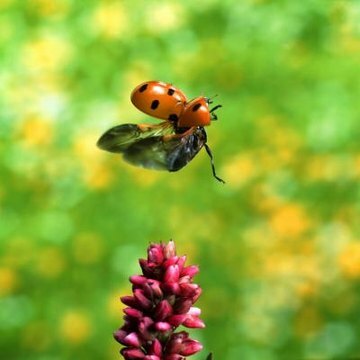 The ladybug may look pretty, be the subject of a children's rhyme and provide pest control in the garden, but she could become a pest in your home, simply because where one goes many others follow. Once they are inside, they are difficult to get rid of, according to the Ladybug Lady website. Why Do So Many Flies Come Into Your House During the Summer? Why Do Silverfish Come Indoors? What Is the Difference Between Wood Roaches & Cockroaches? How Does Cold Affect House Flies?